I know there are lots of wedding favors out there, but I have to say that these are my pick for fall weddings. These jumbo wedding candy apples are perfect for any fall wedding. 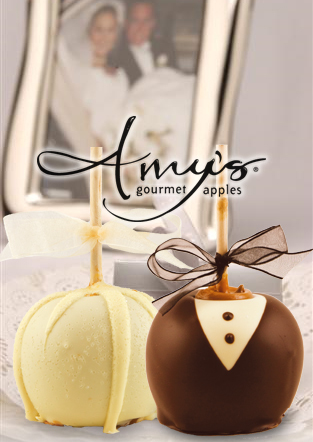 The candy apples are decorated in Belgium chocolate to resemble a bride’s dress and a groom’s tux. Check out Amy’s Candy Kitchen to learn more about how to order these adorable candy apples for your wedding reception.